Owning an RV requires you expand your knowledge in many different avenues, all equally interesting and exciting. One of the most important parts of RV ownership is understanding how to maintain your RV chassis. This is essentially your RV’s foundation, so it is extremely important to take care of it in the best way possible. 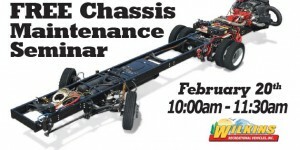 Chassis maintenance is an important part of preserving your RV’s resale value. It reduces the likelihood of an inconvenient breakdown and also ensures you know what is going on with your RV, so you don’t get sudden maintenance surprises. During this FREE seminar at both our Bath and Rochester locations, you’ll get complimentary snacks and a ton of knowledge that will save you from headache down the road. We will cover the topic of motorhome engine cooling and engine compartment maintenance. We will also look at tire maintenance and ensuring your track is correctly aligned. These both impact your fuel efficiency, ride and how your tires wear. Brake maintenance will teach you how to ensure you’re always safe when on the road and highlight any warning signs that might make you want to get your brakes serviced. A better understanding of how to care for your RV is right around the corner. Reserve your spot during this free seminar today and one ready to learn!